We are playing bingo starting August 1st on my Yahoo group. 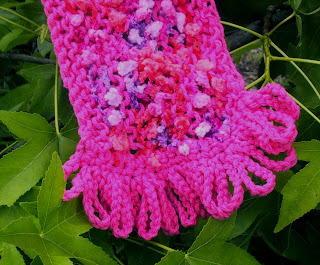 If you want to play use the link to the right to join Suzie's Yarnie Stuff at Yahoo Groups. I'm excited as this is the first game we have played on SYS. Recently I ran across what I thought was a real bargain yarn. 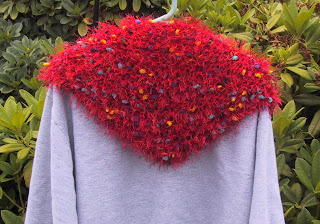 It is Paton's Ci Ci, a super bulky yarn. First I tried crocheting with it. Only luck I had with that was bad luck. So then I tried knitting with it. Casting on was a joke, this yarn doesn't slide on it self at all. I had just about decided to donated it to the Goodwill, then I decided that maybe if I worked with it long ways and cast on with something else I could manage to use it. Well, now I'm in love with this yarn. It is so soft and colorful it really is a delight to the eyes. 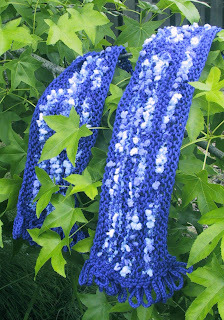 The pattern that follows, Super Bulky and Worsted Weight Scarf, is how I am using up my "bargain" yarn. There are other Super Bulky yarns (gauge 6) and I can't wait to give some of them a go. But first I have 9 more balls of Ci Ci to use up. Pattern edited on 7/21/07 1:32 pm PDT, edit in red. I edited it because the scarf I knit today I ran out of the Ci Ci before I finished the last row if it. Also by knitting an even number of rows of each yarn you can just carry it up the end and not cut. Lots fewer ends to weave in that way. AND we all know that's a good thing. Bind off loosely with WW, do not fasten off. Row 1: Insert I hook in loop remaining from bind off. Ch 1, sc 15-18 times evenly across narrow end. Row 3: Ch 15 slipstitch in next stitch, repeat across. Fasten off and weave in ends. On opposite end, join yarn with a slipstitch. Row 1: Ch 1, sc 15-18 times evenly across narrow end. Since Dollar Tree has been having Fancy Fur recently, need I tell you how my stash has grown? 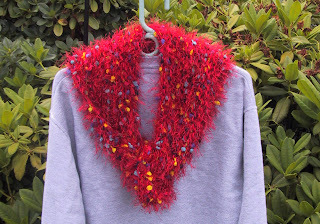 This quickie triangle scarf is something a little different than the long garter stitch scarves we have all been knitting with the novelty yarns. Work holding together one strand of each yarn throughout. Work in garter stitch, increase 1 st at beginning and end of each row. Increase by knitting into front and back of stitch. Repeat until 69 stitches are on needle. Bind off all stitches loosely. Fasten off. Using the Simply Soft sew button to end of last row. To button scarf put the button through stitches on other end of last row. Some friends and I are working on crocheting preemie stuff for Ronald Mc Donald House in Spokane WA. 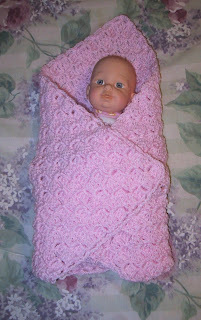 This little doll is wrapped in an 18 inch square blanket, crocheted with the diagonal block stitch. 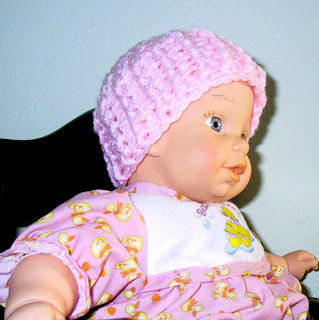 The following posts show the hats that I’m making to match the blankets. 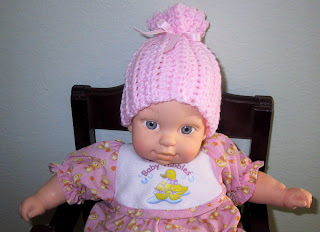 The doll has a 10.5 inch head and is 13 inches long. Ch. 5, slip stitch in 1st ch to form ring.